I enjoy a good fluff read every so often. And, some writers are just better at writing that fluff, you know? 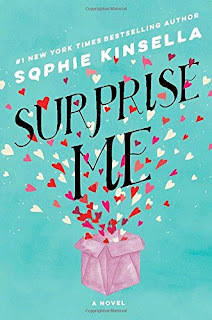 Sophie Kinsella has pretty much mastered her own niche – novels that are romantic comedies that involve plots that are slightly ridiculous, but entertaining. 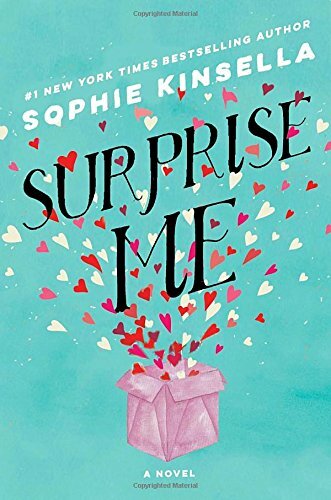 Her latest novel, Surprise Me, is no different. A key difference in this novel compared to many of her previous novels is that it is focused on an already married couple. Particularly, a couple who has been together for ten years and when things begin to get a little bit commonplace. The novel’s main character, Sylvie, becomes desperate to put surprises back into her marriage after learning that humans are living longer than ever before – meaning she will be “stuck” with her husband for a much longer amount of time than she originally imagined. To deal with the extra years ahead of them, they decided to surprise one another. In typical Kinsella style, these surprises run the gamut – and leave the reader feeling quite proud of herself for not being as silly (or dumb) as the characters in the novel. And, Sylvie, makes some really REALLY dumb calls. The results of a boudoir photo session are hilarious, but the some of the surprises cause the couple to reevaluate what they think they know about one another. This novel was standard Kinsella rom-com flair, but it wasn’t my favorite of hers. For me, it took a bit to get off the ground. I wasn’t thoroughly engaged until about halfway through. Also, I picked up on a major plot point very early on and spent most of the time just waiting for Kinsella to finally reveal what seems so obvious. (I’m not just a great reader – it really is that obvious.) But, it must be noted, predictability is part of Kinsella’s charm. However, any fan of Kinsella will eat this one up, as well as anyone who needs an escape from reality and an opportunity to feel better about herself in comparison with the characters. Plus, Kinsella fans who are married or in long-term relationships will appreciate her take on this situation as compared to the stories about finding love as a single woman. * It was released today, so go ahead and order it or put it on hold at your local library!